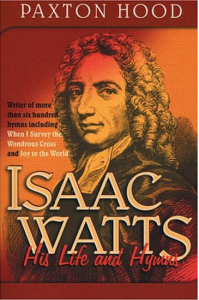 I’m interested in Watts (1674-1748) first for his great contribution to our hymn book. Second because he was an influential pastor, educator, poet, and hymn writer in England just before the time of the Wesleys, John Newton, and William Cowper. Watts was instrumental in getting hymn singing back into the church services among the nonconformist churches. He became the pastor of the chapel in Mark Lane where John Owen had earlier preached. He and Owen would both be buried in Bunhill Fields, the dissenter’s graveyard. Watts was an early premillennial thinker, and delineated an early dispensationalism (See Dictionary of Premillennial Theology). The continuing controversy in our day over men like Watts is whether he would embrace contemporary songs today because he was a champion for reviving hymn singing as well as for writing new songs. But once we also become familiar with his intense piety, both as a love for God’s holiness as well as a profound disdain for the world, such a question is quickly answered. Rather, I think he would be greatly disappointed with those who have removed “such a worm as I” from his hymn, At The Cross, especially when he said of himself that it was grace alone that turned “a groveling earthworm into a bird of paradise.” Paxton Hood, himself a nineteenth-century English pastor, writes, “It is not easy to mention a writer who more distinctly realizes to the mind one of those six-winged seraphs Isaiah saw . . . . But reverence, an awful sense of the mysterious and inscrutable, governed every movement of his soul.” Watts surely wrote new music but it was the music of the Christian soul and the prevailing thought of dissenting and persecuted Christianity. “Are there no foes for me to face? Must I not stem the flood? Is this vile world a friend to grace, To help me on to God?” I think not!